Have you ever snorkeled or scuba dove in a coral reef? If you have, and I asked you to describe the experience in less than five words, I bet your answer would be an explosion of color. Well, maybe you would express it slightly differently, but I am sure that you would include the word color in your description. Coral reefs are one of the most colorful spectacles of nature; electric blues, vivid yellows, striking pinks, and swirly greens fill the eye coming from everywhere, both from the corals themselves and from the myriads of fish species that inhabit this incredibly diverse ecosystem. Scientists have suggested several explanations for such a dazzling array of colors and design patterns. Highly conspicuous fish may be warning predators that they are toxic, or, almost the opposite, they may be trying to camouflage by blending into a background mosaic of colorful corals and algae. Intricate color patterns may be also useful for species recognition when attempting to find a mate in such a crowded environment, and they may even allow individual recognition. 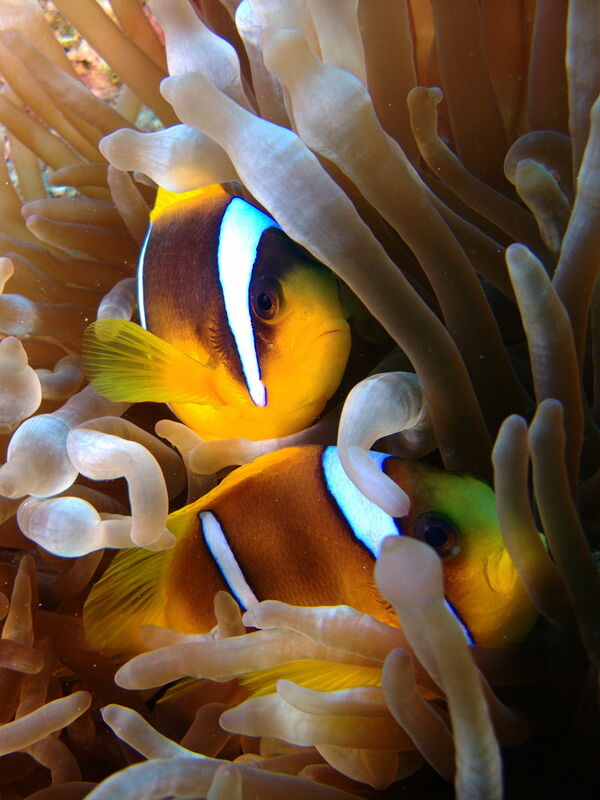 As a marine biologist specialized on animal behavior, I find all these explanations quite compelling yet, as a Christian scientist, I would suggest at least one additional reason for the amazing variety of colors, shapes and patterns that we see in coral reefs: God’s overwhelming creativity. Besides their functionality, God filled coral reefs with a profusion of colors for us to enjoy the beauty of life, the same way He composed birdsongs for much more than attracting mates or exhibiting territoriality. God’s extraordinary artistry and sense of esthetics always amazes me; when He created the heavens and the earth he made everything not only very good, but also very beautiful, and despite all the distortion caused by several thousand years of sin, we can still admire and enjoy that beauty. A colony of the soft coral known as the "bent sea rod" stands bleached on a reef off of Islamorada, Florida. 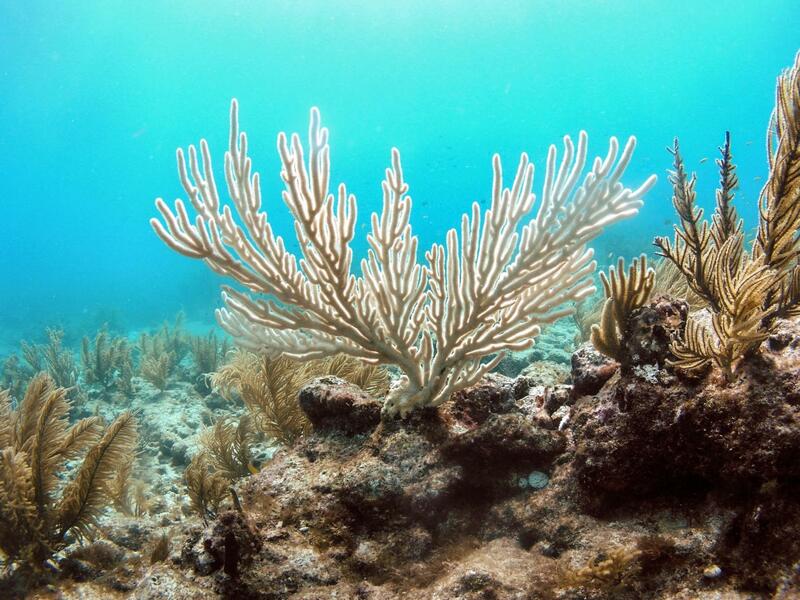 Hard and soft corals are presently bleaching- losing their symbiotic algae – all over the coral reefs of the Florida Keys due to unusually warm ocean temperatures this summer. Months with waters warmer than 85 F have become more frequent in the last several decades compared to a century ago, stressing and in some cases killing corals when temperatures remain high for too long. Photo credit: Kelsey Roberts, USGS. release the symbiotic microscopic algae that color them, and turn white. Warmer water temperatures due to global warming may cause coral bleaching, and several massive bleaching events have been recorded around the globe in the last decades (Brown 1997). On the other hand, we are coloring specific sites of the oceanic scenery that were specifically characterized by their lack of color. In the middle of the North Pacific Ocean, billions of tiny colored particles accumulate where we should see only shades of blue; the white coasts of the Arctic are dotted with colorful objects of many shapes and sizes, and so are the creamy beaches of remote islands all over the world. These colorful invaders can be found even inside the bodies of many marine animals such as fish, seabirds and sea turtles. As you have probably guessed, I am talking about plastics. Plastic pollution in the ocean is a huge conservation problem that also impacts human health (Derraik 2002). The same characteristics that make plastics so useful – they are light, strong, durable and cheap – turn them into a serious hazard. Plastics ingested by marine animals reduce their actual food consumption and fat deposits, weakening them and hindering long migrations. Large plastics may even block their intestinal track and cause death. 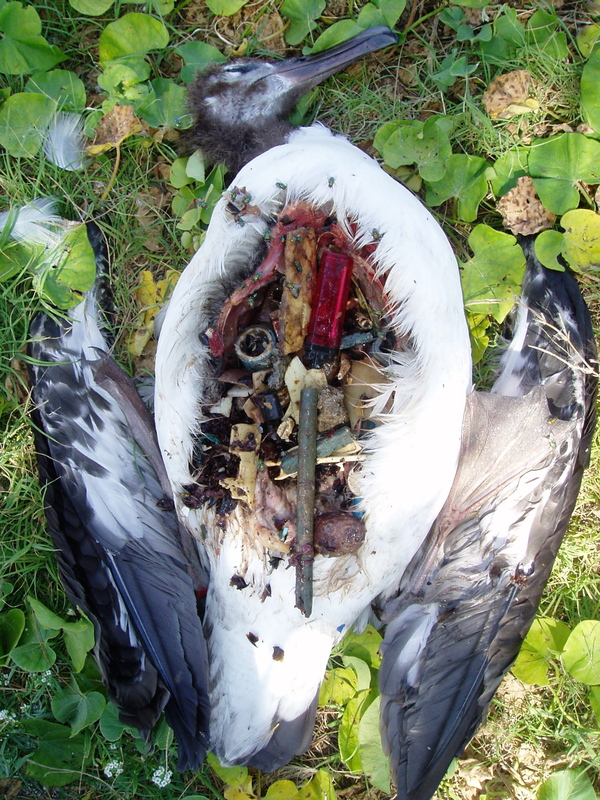 Colored plastics attract seabirds and they often use them to feed their chicks. Entanglement is an additional threat to seabirds, sea mammals and sea turtles, which often get caught in plastic debris when they are young, causing deformed growth, or strangling them to death. Moreover, plastics contain persistent organic pollutants (POPs), known to alter hormone levels, cause reproductive disorders and increase risk of other diseases (Derraik 2002; Seltenrich 2015). When plastics are ingested, these POPs accumulate in the animal tissues and may be passed on along the food chain, eventually reaching humans. In this very moment more than 5.25 trillion plastic particles weighing more than 269,000 tons are floating on the sea (Eriksen et al. 2014). Where did they come from? Oceans do not produce plastics. They come from land, from my kitchen, from my trash can, from the package of my sandwich, my shampoo bottle, my grocery bag, my pen, my sandals, my cell phone case, my food containers… I am a marine biologist and nevertheless, my plastics are contaminating the marine environment, killing marine animals and poisoning people. You may think that your case is different, because you recycle. Guess what! I recycle too, and I used to feel good about it, until I found that most of the “recyclable” materials that we proudly deposit in our blue containers end up shipped to some underdeveloped country, and dumped in an unregulated landfill over there. Three years ago I did a project on plastic pollution for my class The Bible and Ecology. I read several books and papers on the topic, watched documentaries and consulted specialized websites. Several of these sources pointed out the long life of plastics, their high toxicity, and the difficulty of proper disposal and recycling. Because of my scientist mindset, I wanted to check the accuracy of this information, so I went to visit the recycling facility for the city of Loma Linda, and asked what they do with the recyclable plastics. The answer was: We clean them, separate them by types, compact them, and… send them to China! After that conversation I realized that I cannot just assume that others would take care of the problem. My plastics were my responsibility and if I wanted to be a consistent environmentally responsible Christian biologist, I should do something. I decided to reduce my plastic footprint as much as possible, so I stopped drinking bottled water, brought reusable fabric bags to the grocery store, and chose glass or metal food containers instead of plastic. I would love to say that I am still doing that, but it would not be true. At some point, convenience won over will and, to my shame, disposable plastics came back into my life. Does this story sound familiar? I have heard similar experiences from many people, which made me wonder if it is even possible to go countercurrent on this issue and live without using plastics in our current culture of disposability. Well, actually it is. I could give you several examples of people who have succeeded, some of them I know personally, but probably the most famous case is a woman named Beth Terry, an accountant from Oakland, California, who has lived plastic free since 2007. You can read her story at www.myplasticfreelife.com. offer paper packaging instead of plastic, and to take back some of their plastic products to be truly recycled. It is not my intention to make you feel guilty (or maybe just a little). What I would really like, for myself and for anyone who cares for God’s wonderful creation, is to encourage us to take the plastic problem seriously, and do something meaningful, for once and for all. Maybe you are already doing the best you can. Good for you! Maybe you did not even know how serious this issue is. In that case, I would recommend that you watch the documentary Plastic Planet, by Werner Boote, read the book Plastic: A Toxic Love Story, by Susan Freinkel, and check out the website http://storyofstuff.org/movies/story-of-bottled-water/. Maybe you already knew, but, just like me, you needed a boost to really commit. In Beth Terry’s website, she lists several good reasons for giving up plastics, such as to stop doing harm, protect health, and support ethical business. For us, Christians who believe in a Creator who made very good and very beautiful marine creatures, and put them under our stewardship, we have a powerful, additional reason to add to the list. God put us in charge of the true colors of the ocean, and we should start taking them back where they belong. So, what if we enjoy the dazzling colors of the coral reefs, but let the open ocean to be blue, the polar ice to be just white, and the sandy beaches to show the true color of the sand? Brown, B. (1997). Coral bleaching: causes and consequences. Coral Reefs 16, S129-S138. Derraik, J. G. B. (2002). 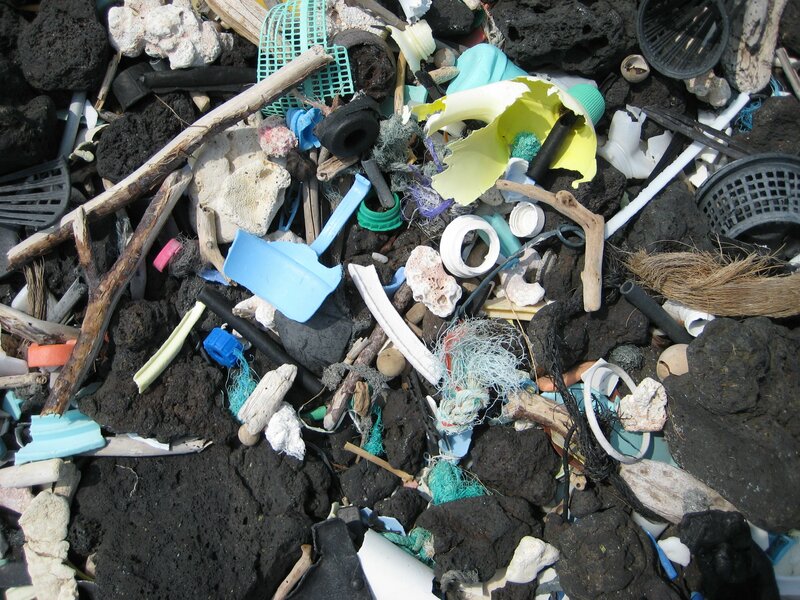 The pollution of the marine environment by plastic debris: a review. Marine Pollution Bulletin 44, 842-852. doi: http://dx.doi.org/10.1016/S0025-326X(02)00220-5. Eriksen, M., Lebreton, L. C., Carson, H. S., Thiel, M., Moore, C. J., Borerro, J. C., Galgani, F., Ryan, P. G., and Reisser, J. (2014). 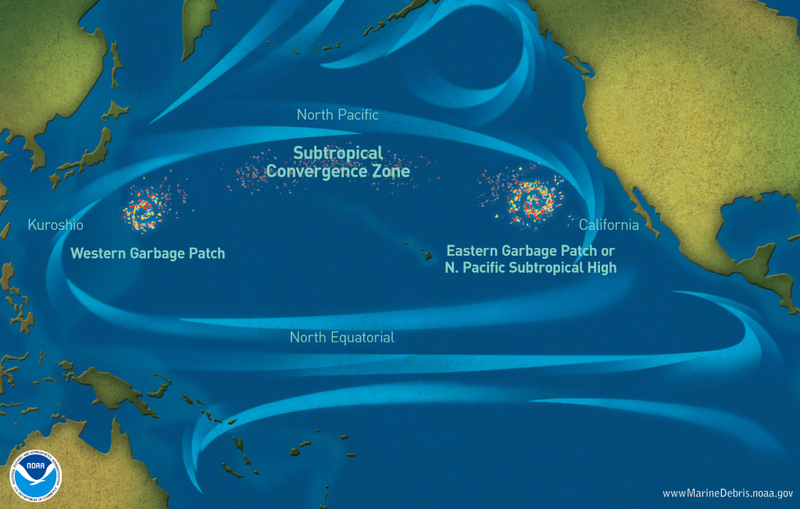 Plastic Pollution in the World's Oceans: More than 5 Trillion Plastic Pieces Weighing over 250,000 Tons Afloat at Sea. PLoS ONE 9, e111913. Seltenrich, N. (2015). New link in the food chain? Marine plastic pollution and seafood safety. Environmental health perspectives 123, A34.